The Maroons (22–4) topped Johns Hopkins (18–6) 5–1 in Monday’s national quarterfinal. Chicago will face Amherst in its fourth semifinal appearance in four years. Four years—four national semifinal appearances. Chicago (22–4) topped Johns Hopkins (18–6) 5–1 in Monday’s national quarterfinal in Cary, N.C. But the score does not tell the entire story. While fourth-year Jennifer Kung and third-year Linden Li gave the Maroons an early team lead with an 8–5 win at No. 2 doubles, an 8–6 loss by first-years Kelsey McGillis and Megan Tang at No. 3 evened up the score. A win at No. 1 doubles would give the edge to the winning pair’s team heading into singles. Johns Hopkins seemed likely to take that advantage as Hailey Hogan and Nandita Krishnan took a 4–2 lead. Fourth-years Kendra Higgins and Carmen VacaGuzman came back, though, and evened the score at eight games apiece. In the tiebreaker, Higgins and VacaGuzman overcame another deficit—this time at 4–1—to win 7–4. “Being up 2–1 after doubles play definitely gave us some momentum going into singles,” VacaGuzman said. 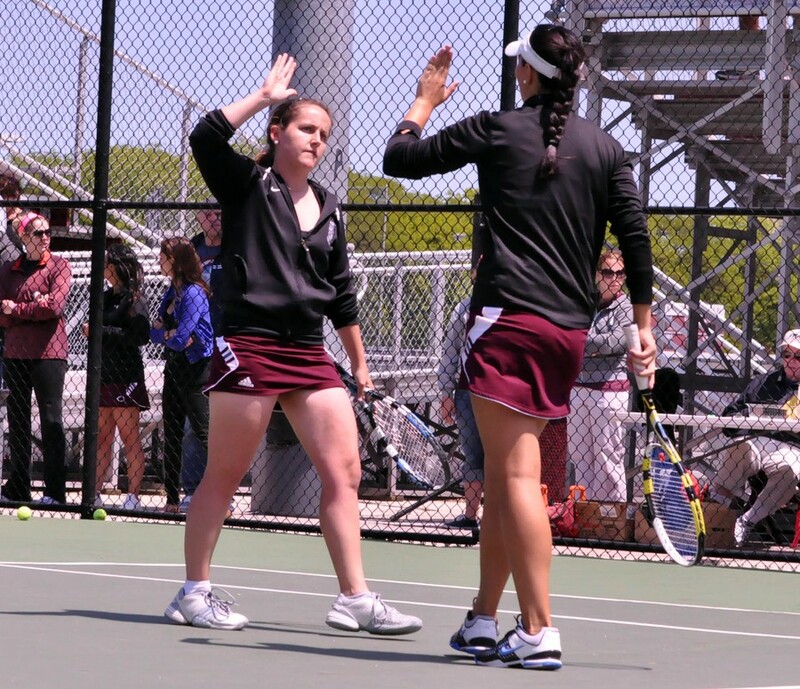 With the lead heading into singles, the Maroons needed three wins to clinch a semifinal spot. Those wins came from Higgins (6–3, 6–2) at No. 1 singles, Kung (6–2, 6–2) at No. 2 singles, and McGillis (7–5, 6–1) at No. 6 singles. Although the other matches went unfinished after McGillis’s clinching performance, momentum was on the Blue Jays’ side. Tang was down 6–3, 5–4, Krishnan was ready to even up her match against VacaGuzman to split sets, and Li was mired in a tight second set after winning the first 7–6. The last time Chicago met Johns Hopkins, the Maroons won 6–3. VacaGuzman said that the two bouts with Johns Hopkins marked grueling tennis. After the Maroons won, Amherst (18–3) barely edged out Carnegie Mellon 5–4. Chicago had beaten Carnegie Melon 8–1 earlier in the year. The South Siders will play Amherst in the national semifinal for the third time in four years at 11:30 a.m. today.